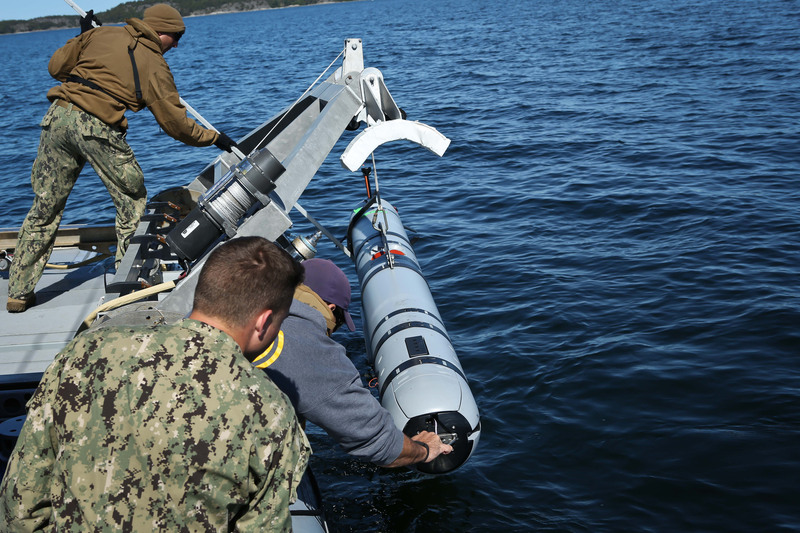 THE PENTAGON – The Navy is standing up a continual improvement process for its family of unmanned underwater vehicles, in the hopes of bringing better sensors, endurance and more to the newly expanded portfolio of UUV’s that fall under the undersea warfare division (OPNAV N97). With all UUVs moving under N97, including the mine warfare systems previously housed under the expeditionary warfare division (OPNAV N95), an opportunity exists to leverage research dollars, lessons learned and more amongst a larger set of UUV systems, N97 acting director Brian Howes told USNI News in a Nov. 15 interview. “In the past we have focused on a mission and then designing an unmanned undersea vehicle to match that mission. As we have gone to this family of systems approach, we realize it’s not just about one vehicle – it’s about, there are common attributes amongst a class of vehicles, whether it is propulsion, whether it’s autonomy, command and control, the endurance and reliability. All of those attributes span all the vehicles,” Howes said. Howes said the Navy is currently setting up a formal mechanism for determining fleet demands and determining how to spend available resources to research and develop those needed capability upgrades. “Our submarine combat system approach for open architecture is the Submarine Warfare Federated Tactical Systems, SWFTS. We have a process where we are continually improving our combat systems on a two-year hardware update and then a two-year software update. The method which we determine how we’re going to update that and what the capabilities are that we increase is a fleet, OPNAV and [Naval Sea Systems Command] collective, we call it the Submarine Tactical Requirements Group. We use that body in order to determine the highest capabilities and where our next resources should go,” Howes explained. Howes noted that that process would be aided by the work of the first UUV squadron, which was stood up in Keyport, Wash., in late September. UUVRON-1 operators will provide user-level feedback to N97 to help shape requirements for future upgrades.